Union home ministry said four terrorists had hit the Pathankot air base earlier this year, contradicting Rajnath Singh’s earlier statement. 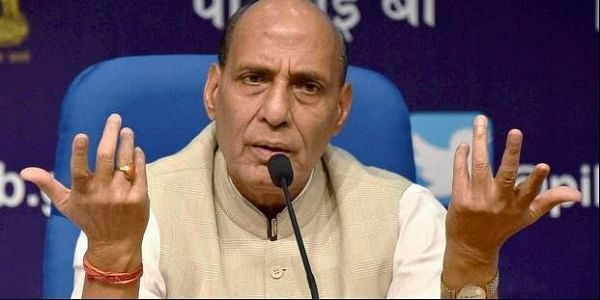 NEW DELHI: In a written reply to the Lok Sabha on Tuesday, Union home ministry said four terrorists had hit the Pathankot air base earlier this year, contradicting Home Minister Rajnath Singh’s earlier statement in March that six terrorists were involved in the attack. The gaffe came in a written reply from Minister of State for Home Hansraj Gangaram Ahir to a question from Congress MP Ravneet Singh, grandson of slain Punjab chief minister Beant Singh. “Four Pakistan-based terrorists entered Punjab via Janial Road, Dhusi turn, near Ravi river bridge, Gulpur Simli village and attacked air force station in Pathankot,” Ahir said in a written reply. Soon after the faux-pas came to light, the Centre scrambled to correct the “mistake” and blamed bureaucratic goof-up for the reply. “The official figure of terrorists involved in the attack is still six and it was nothing but a drafting mistake. We have pulled up the official who drafted the written reply and it was unintended. We will request the Speaker tomorrow to rectify the mistake,” said a senior North Block official. Sources said top officials in the ministry got together to prepare a clarification to be given on the matter in Parliament on Wednesday. The gaffe came a day after National Investigation Agency got the Home Ministry’s nod to prosecute Jaish-e-Mohammad chief Masood Azhar, the alleged mastermind of the terror attacks on Pathankot airbase and three other Pakistani nationals. “It shows the government is yet to resolve the row over the number of attackers killed in firefights at Pathankot airbase. This is bound to happen when security agencies are still not sure about the exact number of attackers,” a home ministry official said. In March this year Union home minister Rajnath Singh had said six terrorists were killed, a figure also later put out by defence minister Manohar Parrikar. NIA which is probing the case have said that while the bodies of four had been found, the remains of the other two had not. Sources in National Security Guard had maintained two of the six terrorists were “neutralized” by firing the cannon of a BMP II armoured personnel carrier into an airmen’s billet. But their clothes, weapons or human remains were not traced. In May last year the Centre’s statement in Lok Sabha that it did not know Dawood Ibrahim’s whereabouts had rocked Parliament, with the Opposition accusing the Narendra Modi government of “tarnishing” the country’s image as India had always maintained that the mafia don was hiding in Pakistan. Similarly the gaffe had come in a written reply to a question on the possible extradition of Dawood, a 1993 Bombay blasts suspect. Later the home ministry had to issue a clarification.